CABLE HIGHLIGHTS: USA’s WWE telecast was at 1.13/1.13/1.02, compared to last week’s 1.10/1.09/1.01. VH1’s LOVE & HIP-HOP was at 0.93/0.90 compared to 0.92/0.89. Discovery’s STREET OUTLAWS was at 0.91/0.55 compared to 0.67/0.47, and lead-out SHIFTING GEARS premiered at 0.55. On Bravo, VANDERPUMP RULES was steady at 0.53, and SUMMER HOUSE was down 0.09 to 0.17. On TBS, AMERICAN DAD jumped 0.12 to 0.49, and FINAL SPACE was up 0.04 to 0.30. On Food Network, KIDS BAKING CHAMPIONSHIP climbed 0.11 to 0.43, and RIDICULOUS CAKES was up 0.06 to 0.26. MSNBC’s RACHEL MADDOW SHOW topped cable news at 0.41/0.64/3.4M, over CNN’s ANDERSON COOPER 360 at 0.31/0.39/1.3M and Fox News’s HANNITY at 0.28/0.50/2.9M. TNT’s THE ALIENIST dropped 0.08 to 0.37. 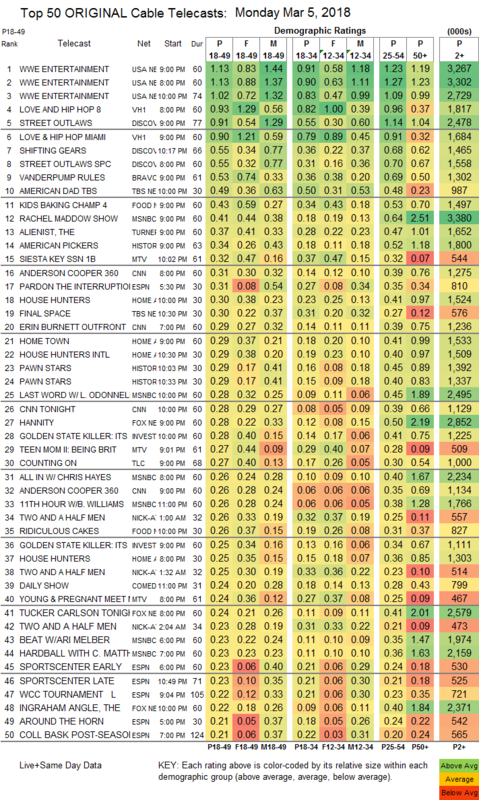 On History, AMERICAN PICKERS rose 0.08 to 0.34, and PAWN STARS was at 0.29/0.29, compared to last week’s 0.28/0.26. MTV’s SIESTA KEY was up 0.03 to 0.32, with a lead-in from TEEN MOM: BEING BRIT at 0.27, which was itself led in by YOUNG & PREGNANT at 0.24. On HGTV, HOUSE HUNTERS gained 0.06 to 0.30, HOME TOWN rose 0.05 to 0.29, and HOUSE HUNTERS INTL was up 0.02 to 0.29. On ID, GOLDEN STATE KILLER premiered at 0.28/0.25, and VANITY FAIR CONFIDENTIAL ticked down to 0.21. 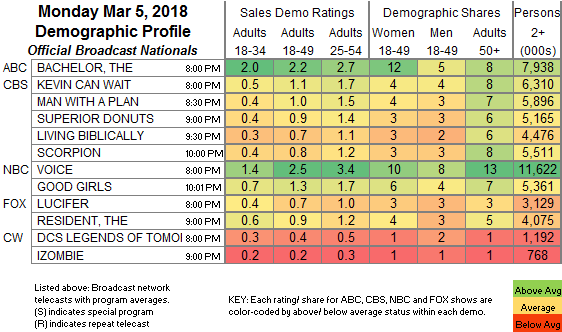 TLC’s COUNTING ON held at 0.27. A&E’s JONESTOWN documentary premiered at 0.12, followed by the premiere of DIVIDED STATES at 0.09/0.08. AMC’s MCMAFIA lost 0.02 to 0.12. Lifetime’s UNREAL ticked up to 0.09. WGN’s SHOOT THE MESSENGER remained off the chart and is likely to stay there, down 0.01 to 0.02/129K.